Tuesday night was the 20 year anniversary of Pulp Fiction. I was 14 when it was originally released so never saw it in the cinema. I think the first time i saw it was on a Pirate video at school. I also remember one night watching it with Phil and our then girlfriends when he lived about the wedding shop in Woodford. It feels like yesterday even though its over a decade ago. Re watching it today had several effects. Firstly its still shocking, strong violence and the language it is certainly not politically correct. I could certainly see that it was made on a budget, but despite some aspects being firmly 90's only a couple of mobile phones, people using pay phones, it didn't feel dated as some films of the era. The violence in Pulp Fiction is less comic, and less bloody than in Tarantino's later films like kill bill and inglorious bastards. In my opinion Tarantino redefined cinema with Pulp Fiction. Prior to its release that films had become extremely formulaic, to the point when with ever single line of dialogue existing to further the plot. Pulp fiction turns that on its head, presenting the narrative out of sequence and adding scenes only to entertain with dialogue. Yes the language and tone are shocking, again this is a pastiche of 70s cinema (where some of the visual style comes from and what was considered a golden age of cinema). There scenes with Samuel Jackson discussing burgers or John Travolta dancing badly (remember he was best known for his dancing in Saturday night fever). Overall I really enjoyed re watching a modern classic. I have just returned from the airport after having dropped off Kath. We have spent the last week together, I think it's the longest time we have spent together since Christmas. She arrived last Tuesday evening, I picked her up after work on the late flight. I had to work Wednesday and Thursday so she relaxed and visited with my mum. Thursday evening we went out to Lobster Steak at the Radisson Blu hotel in Manchester. An interesting concept they only have two menu choices, lobster or steak. You get unlimited fries and salad on the side whichever you choose. Kath and I both ordered steak medium rare. Kath's was more on the rare than medium (almost blue) so we had to send hers back for more cooking. The meal was very pleasant though I think my steak had a little too much gristle, and personally would have preferred chips to fries but overall a very nice restaurant treat. Friday, I had the day off so we went round the shops. Primarily we were looking for some new furniture for the garden. Nothing seemed to be comfortable at a price we wanted to pay. Stopping in at Waitroise we bought some nice cheeses and meat to make a platter which we ate watching the Wolf of Wall Street. It was an enjoyable film, Di Caprio was on top form. morning then went off to see the garden at Tatton Park. 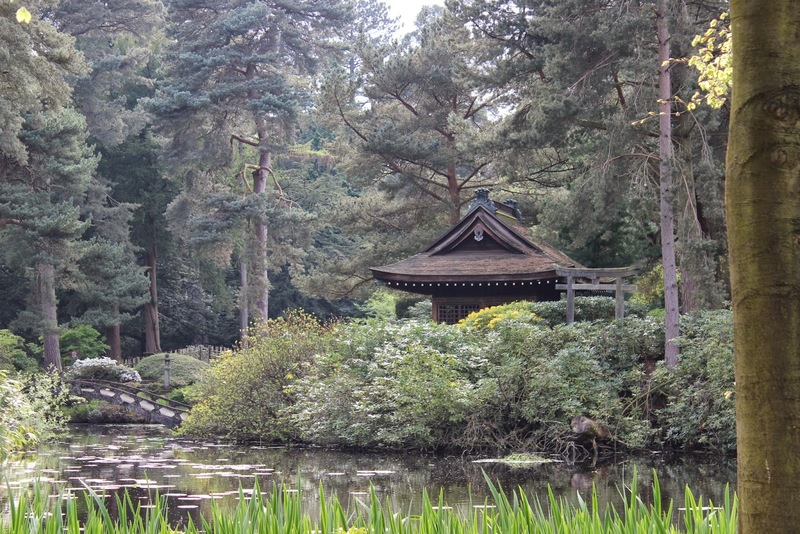 The Japanese garden there is amazing, the best I have seen outside of Japan. Its well worth a visit. Inspired by the Gardens we decided to have an evening meal at the Samsi in Wilmslow. Chatting to the waitress apparently she and her partner have taken over running it. We did noticed a few new touches and the food was excellent, especially the sushi rolls. Afterwards we headed into the Bollin Fee for a drink. Taken in by the marketing we enjoyed a Captain Morgans served in a plastic cannon ball, living like the captain! Sunday, we went to my parents for a roast pork lunch. It was very tasty, even got some crackling. After lunch we had a chat with my parents, enjoying a coffee. Then Kath and I headed to Bramhall Park for a walk. Monday, we decided to tackle the garden a little more. Replacing the old rotten tub out the front with a more contemporary pot. At the back we turned a small patch of dirt near the gate into a rockery. 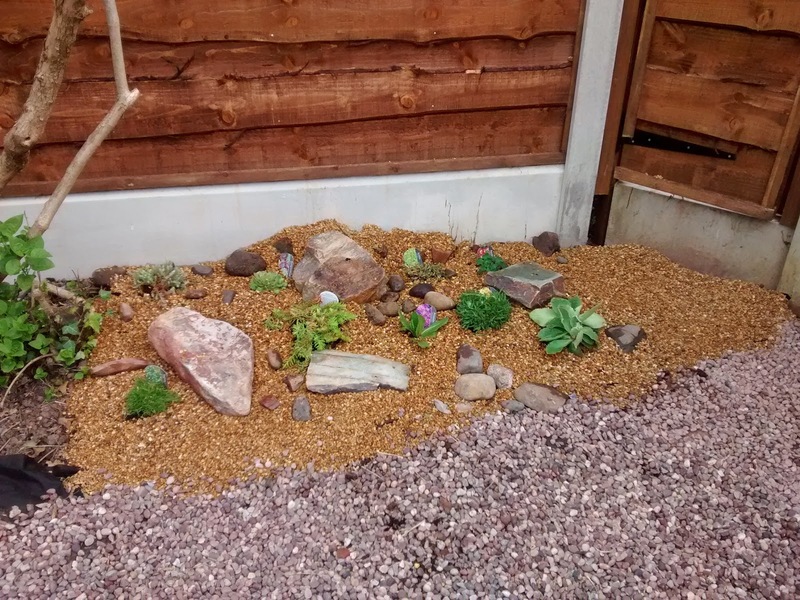 It looks really nice, with golden grit and new alpine plants. In the evening Nina and Bruce arranged for another curry at the Sangam. It was basically a replay of two weeks ago with the addition of Kath and Ian. Apparently Ian has managed to sell his flat and is enjoying life with Helen. Unfortunately she wasn't able to join us, hopefully I will get to meet her soon. Bruce was telling us all about a website where you can buy surplus equipment from the armed forces. He was after an ICBM launcher from the Cold war era, or an armour plated Bentley! Overall a throughly enjoyable evening.